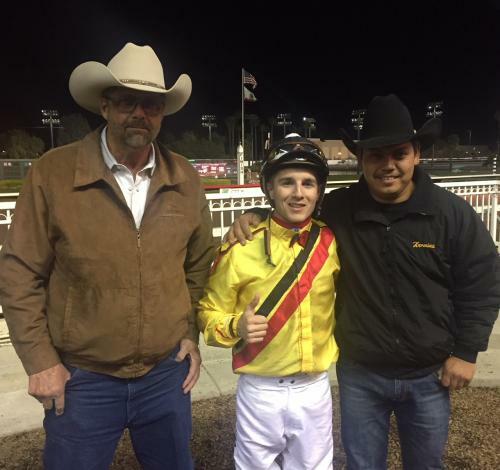 Jockey Vinnie Bednar has enjoyed a good week at Los Alamitos. On Thursday night, Bednar was named the Val Tonks Award winner presented to the top up-and-coming rider at Los Alamitos. On Friday night, Bednar won his first Quarter Horse stakes race of the year after piloting Ed Allred’s Well Good to a head victory over Ronnie Brooks Keller’s Twisted Sifter in the $25,000 Cypress Handicap at 350 yards. Bednar piloted 14 Quarter Horse winners in 2017, but he stepped up to a higher level in 2018. Riding Quarter Horses mostly for Allred and trainer Scott Willoughby, Bednar piloted 38 winners from just 201 mounts last year, with 29 of those wins coming after August 9. So far in 2019, Bednar has already piloted He Looks Hot to victory in a trial to the Grade 1 Brad McKinzie Los Alamitos Winter Championship and now Well Good in the Cypress. Bednar is looking forward to continuing his Quarter Horse riding exploits aboard He Looks Hot in the Brad McKinzie Los Alamitos Winter Championship final on February 10. The Willoughby-trained Well Good covered the distance in :17.568 to record his fourth win in 26 career starts. The Kiddy Up gelding has finished in the top two 17 times and in the top three in 21 of his career outings. The Allred-bred sprinter earned $13,750 to take his career earnings to $85,579. Ridden by Jonathan Roman for trainer Roman Figueroa, Twisted Sifter $5,625 for his runner-up effort. The nation’s leading Quarter Horse in wins with eight in 2018, Twisted Sifter was also named the Pacific Coast Quarter Horse Racing Association most improved horse of last season. Scoopie Inc. Corporation’s Scoopie Jess finished third and was followed by Apollitical Wagon, JD Wagon Boss and Jazzy Icon.